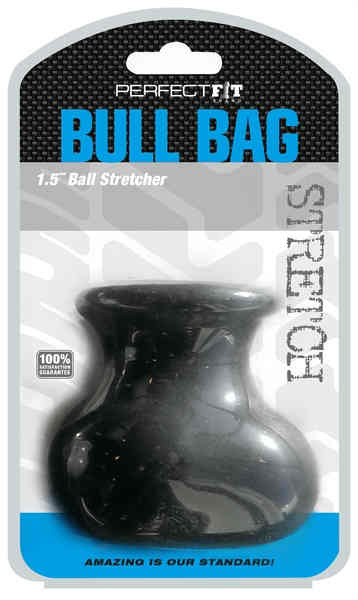 Part ball stretcher and part ball weight, the Bull Bag is two scrotum toys in one! Simply stretch the opening on the top of the Bull Bag and gently release over your entire scrotum and you are ready to go. The Bull Bag gives an incredibly pleasing 1.5 inches stretch and tug for that extra overload hanging right between your legs. The Bull Bag also works for giving your package that extra-large bulge under your favorite pair of jeans. The Bull Bag is made of Perfect Fit Blend which is a perfect mix of Silicone and Thermoplastic Rubber TPR that gives it an unbelievable stretch factor. The Bull Bag is safe with water based lubes. Wash thoroughly with mild soap and water and store item separately wrapped in a soft cloth or pouch. The Bull Bag is available in black and clear. Each sold separately. This product is porous and not compatible with latex products.